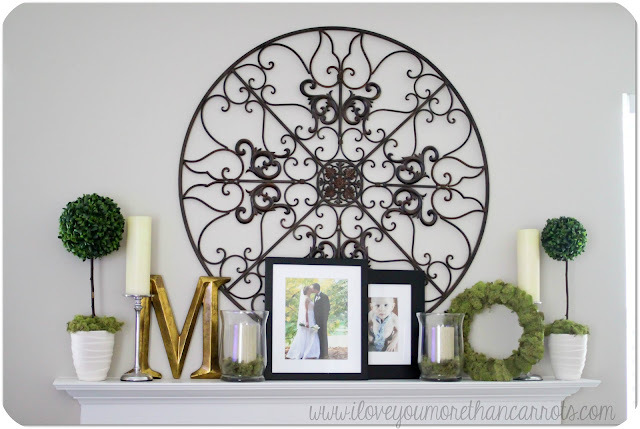 I Love You More Than Carrots: Mantle Makeover :: DIY Topiary Included! Just last week I posted a really simple Boxwood Topiary D.I.Y project that was the inspiration for a little Mantle Makeover that was long overdue. I wanted to pop in and share how our mantle currently looks with two of the boxwood topiaries. You'll notice that I also included a moss wreath as an afterthought. I ended up with three-quarters of an entire bag of moss leftover and I couldn't bear to see it go to waste. I set to rummaging through the disgrace of a craft guest bedroom closet that I have and found a spare styrofoam wreath. What's a girl to do with extra moss, a hot glue gun and a spare styrofoam wreath? Easy. Hot glue said moss to wreath and call it a day. I also threw a little extra moss into each of the hurricane jars that house two gold candles. I'm really happy with how the mantle looks thus far although it still has a long way to go. I'm not thrilled with the two picture frames in the middle and have yet to decide what will take their place. Obviously I'm thinking some sort of greenery project. Also, I'm no longer a fan of the wrought iron wheel that sits atop our mantle and will be replacing it with some sort of mirror-type addition soon. I recently stumbled across this pin and am thinking about testing it out. They look a bit labor intensive so I'm think it's a project that will be tackled during a weekend when The Husband is willing to occupy two sets of tiny hands for a few hours. So, what have you D.I.Y'd lately? I'm always looking for new ways to decorate since we don't have a mantle & very little shelf space. I hung some floating shelves on each side of a huge clock in my living room but not really loving that look anymore. Wow, that looks amazing!! I love what you've done with it and can't wait to see more! That looks fabulous!!! There are so many pretty mirrors at Home Goods right now. I think it looks great. I like the big iron wheel- and I like the pictures too! Maybe add a third picture adn that would bulk it up. I'm proud of you for making time to craft with 2 boys- YOU"RE MY HERO! Your mantle looks great! I miss having one. I need some DIY time! I miss being crafty. That looks amazing! Makes me wish I had a mantle to decorate. But then I have trouble decorating the end tables and TV console so maybe it's good I don't have a mantle too. haha! Well, I haven't DIYed anything lately but I'm totally using this as inspiration next week when we move into our NEW HOUSE!!!! I want a starburst mirror and have been keeping my eyes peeled.